At the Nov. 8 Lancaster City Council meeting,, the Lancaster Human Relations Tapestry Commission made a presentation before the City Council, outlining their mission and functions as a commission. LANCASTER – The Human Relations Tapestry Commission held its first public meeting Wednesday at 6 p.m. in the City Council Chambers at Lancaster City Hall. Items on the agenda included updates on its Expungement Program status and Mediation Program status, as well as a discussion on the development of open meeting community presentations. The new Human Relations Tapestry Commission was formed at the request of Lancaster Mayor R. Rex Parris with the goal of bringing together various groups, cultures and individuals throughout the City of Lancaster. 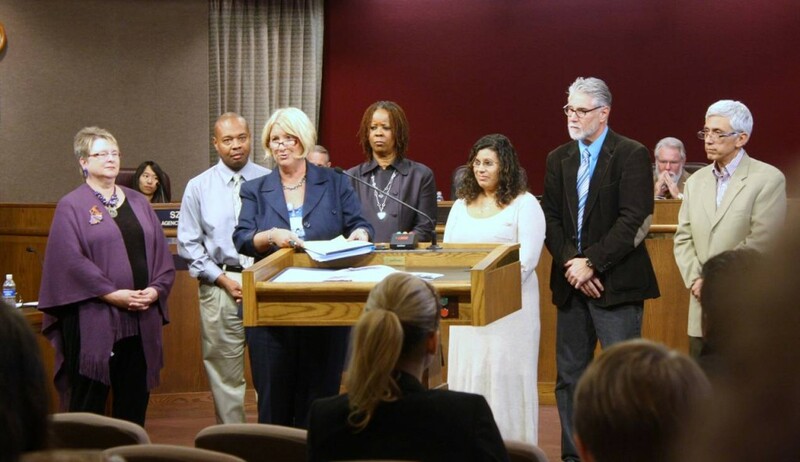 During a presentation to City Council on Nov. 8, the Human Relations Tapestry Commission declared their mission: to celebrate uniqueness, embrace common viewpoints, and create opportunities to flourish. And facilitate expungement applications to Los Angeles County Superior Court for well-deserving, upstanding citizens who have unfortunately committed a non-violent crime in their past. The Human Relations Tapestry Commission represents an array of diverse backgrounds and lifestyles, and is currently comprised of Chairperson Sue Dell, as well as Commissioners Arturo Castanon, Vivian Komori, Dr. Mark Marshall, Jeanine Militello, Dr. Arisah Muhammad, and David Paul. A press release from the City of Lancaster, issued Tuesday, gave brief backgrounds on each commissioner. The Founding Chair for the Tapestry Commission, Dell also serves on the Board of The OUTreach Center, which provides quality support services, community advocacy, and professional resources to the local lesbian, gay, transgender and bisexual community. Dell has been a Dependency Court Attorney in Los Angeles County for more than 15 years and has represented the legal needs of nearly 1,400 court-appointed Antelope Valley residents. She is also a certified mediator, having finalized nearly 100 child adoptions. Dell is a trainer for Court Appointed Special Advocates (CASA) and a 2011 Athena Award Nominee. In Mexico, Arturo Castanon participated in the privatization process of the Mexican Railroads as an interpreter and translator. He also assisted in accomplishing major deals between American companies and the recently privatized railroad. Castanon has volunteered for The Children’s Center of the A.V., A.V. Hispanic Chamber of Commerce, A.V. Red Cross, and the Community Emergency Response Team (C.E.R.T.) He has also organized and led “Art Studio AV” a series of monthly meetings, workshops and seminars designed to promote artists and provide a venue for them to teach, learn, and network. He has provided ESL instruction to the Hispanic community. Vivian Komori serves as the host of The Broad Perspective and is founding partner of The Broad Perspective Network, a 24/7 internet radio station which launched in April 2011. Komori has interviewed hundreds of very well known personalities around the world including royalty, celebrities, bestselling authors, scientists, and physicians. Komori is the CEO of Komori Connections, Inc. which is the holding company for five subsidiaries. She is the director of a non-profit, The Gaia Foundation. Ms. Komori also has significant involvement with Flor del Desierto / Friendship Bridge as well as Microloan program for Guatemalan women. Dr. Mark Marshall was born and raised in Houma, Louisiana. An educator for nearly 25 years, Dr. Marshall has worked as a Special Education Teacher, Special Education Supervisor, Assistant Principal, Middle School Principal, and High School Principal. In May 2010, Mark became Director of Student Services and Special Education for the Eastside Union School District. A resident of the Antelope Valley for 23 years, Jeanine Militello is a certified paralegal in the process of obtaining her Associate of Science degree in paralegal studies from the University of Antelope Valley (UAV). As a member of Christ the King Episcopal Church, Militello helped organize a social service outreach program to bring free medical services to the community. The program, Shepherd’s Care Outreach, earned a Jubilee Ministry certification from the Los Angeles Diocese. After recovering from her own 25-year addiction (now enjoying 18 years of sobriety), Dr. Muhammad utilizes her education to help men and women realize that they can bounce back from challenges such as domestic violence, poverty, prison, gangs and addiction. A nationally-recognized speaker who tours high school campuses, Dr. Muhammad has delivered keynote addresses for Cocaine Anonymous, California Association of Drug Professionals, and the Black Women and Health Society. She developed a 12-Step Program entitled, “Rising Above Emotion into the Thinking of God,” and also founded her own motivational speaking and counseling business, Worx 4 Me Inc.
David Paul has been attending Lancaster City Council meetings for a number of years and prides himself on speaking on items of great importance to the community at large, such as sensible development, traffic, energy and water policy, disability issues, prayer at public meetings and basic human rights. Mr. Paul has done well with a 6th grade formal education and a U.S. Army G.E.D. His lifelong passion for learning and service continues. His proudest roles are as husband, father, founder of the Church of the Responsible Party, and now as a member of the Tapestry Commission. For more information on the Commission, to apply for an expungement, or to volunteer as a mediator, contact the Lancaster City Manager’s office at 661-723-6007. The Lancaster Human Relations Tapestry Commission is not affiliated with the Antelope Valley Human Relations Commission. The latter is a grassroots, community-based volunteer organization headed by community activist, Darren Parker. 2 comments for "Human Relations Tapestry Commission holds first public meeting"
This one might be good, however most of the commissions are just pay-back to Raymonds friends and political cronies. Our Mayor Raymond is a huge “BIG” government supporter and it costs our City of Lancaster alot of money for his toadee’s to play “big shot” at our expense. David is a buttkiss And I seem to remember a racist joke he made a few weeks back about the dutch..